Duport Properties Limited had already been granted a site licence(SL129.) covering the former rattlechain brickworks area and the newer of the two pits. They had quite shamelessly been allowed to infill this area with a range of putrescible scrap wood materials from nearby companies and together with Birlee Industrial Limited (site licences SL303, SL113) had tipped across the wider area for several years. This site licence was applied for in connection with a planning application by this company DA 18601 granted 17th January 1986. We were aware of some mystery regarding this licence and subsequent planning records which mention the operations that were allowed under this planning application. Please provide by electronic means the full waste disposal site licence SL 502 issued to Duport Properties Ltd in the general area of Rose Lane Tividale. Could you also provide a map of the site as it appeared and the area which it now occupies and summary of when this licence was surrendered and the site remediated if indeed this was the case? A. Reference has been made to historic site records and it can be confirmed that an application was made in 1986, in respect of Waste Disposal License Application SL502. Correspondence dated 1 September 1986 issued by Johnson, Poole and Bloomer to Sandwell Metropolitan Borough Council confirms that with reference to SL502 “In accordance with instructions received from our client, we request that the application for the Waste Disposal License be withdrawn.” Further correspondence from Walsall Metropolitan Borough – Environmental Health and Consumer Services Department – Hazardous Waste Unit, dated 29 September 1986 confirms that in response to the above request, the application for SL502 had been closed. Could you indicate the areas where this license differed in relation to licence SL 129 issued to the same organisation. As stated above, the application for SL502 was withdrawn prior to completion and as such was not applied to the site. 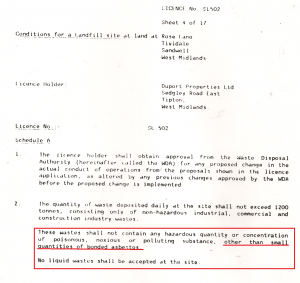 Could you confirm that license SL502 contained within it provision of wastes contaminated with “bonded asbestos”? I realise that this may involve some liaison with the Environment agency, but since some relevant officers used to work together at Walsall Hazardous Waste unit which undertook regulation of the sites on behalf of SMBC, I’m sure that this will be not that problematic. The council confirmed that they had liaised with the EA to compile the response. We have looked at the range of site licences in more detail at this page. 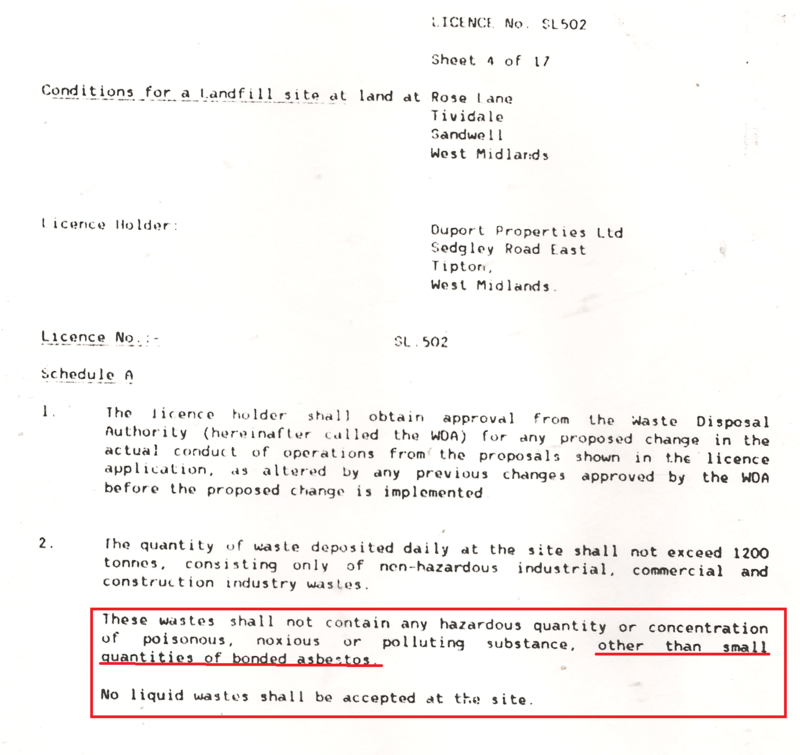 This site licence appears to have been largely unused in terms of what was applied for, but the whole area became used as a “commercial tip” according to records held by Sandwell council with no control being exercised by The West Midlands County Council as to what was going on there. Though the licence was supposedly not followed through , the planning application was certainly granted. The draft for this licence which we have independently obtained allowed the tipping of up to 1200 tonnes of material per day including “bonded asbestos”- despite claiming that no hazardous or poisonous material should be deposited. The vagueness of this is another example of how West Midlands County Council were an unfit organisation to be issuing waste management licences and how over time they did more to damage the environment than ever protect it from harm.